The Green Bay Packers and coach Mike McCarthy agreed to a one-year contract extension earlier this season, a team source told NFL Network Insider Ian Rapoport on Tuesday. To owner Jerry Jones, that isn't acceptable -- and some of it has to do with the play of wide receiver Dez Bryant. "Well, I think Dez is right. We need more from Dez. We need bigger plays," Jones said on 105.3 The Fan in Dallas. "That's obvious to everybody is we didn't get big plays. I don't know that you ever get enough of them, but we certainly didn't get the amount that we have to have to change our fate here. And, so, I agree with him. We need to have bigger plays. "There's a lot into that, but we've got to get more from -- he's [a] top player on our team. He certainly expects to make big plays, the expectation for Dak [Prescott] to get him the ball is there. We've gotten used to it. Yeah, we need more from that area." Bryant caught 69 passes for 838 yards and six touchdowns in 2017. Those are decent numbers for your average receiver, but an offense that was without Ezekiel Elliott for six weeks and never quite got the ground game going had an added reliance on Bryant. He didn't deliver, catching just 69 of his 132 targets for a 52.3 catch percentage. His 838 yards receiving also finished outside of the league's top 25 for the third straight year, but for the first time in 15 or more games played in a season since 2011. The aspect of Bryant's underwhelming 2017 that has received the most scrutiny is his number of drops (6), which tied for fifth-most in the league and drew the ire of Cowboys fans on multiple occasions. None was bigger than the short pass that glanced off Bryant's hands -- a fastball lacking the necessary touch from Prescott -- and was intercepted by a Seattle defender in a game that ruined Dallas' postseason chances. The biggest factor in all of this is Bryant's contract. It's a five-year, $70 million deal signed in 2015, fresh off a season that saw Bryant catch 88 passes for 1,320 yards and a career-high 16 touchdowns. It's since taken him three seasons to match that scoring output, all while his salary-cap number has risen steadily with each year. That number drops in 2018, from $17 million to $16.5 million, but his dead cap number -- a salary-cap penalty incurred by releasing Bryant before the expiration of his contract -- remains an exorbitant $8 million before June 1, according to OverTheCap.com. After that date, it drops to $4 million, creating a cap savings of $12.5 million. Armed with this information, Cowboys executive VP Stephen Jones didn't avoid discussing the decision that looms when appearing on 105.3 The Fan. Considering Bryant's production in the last three seasons -- he hasn't broken five catches per game since 2014 -- he's overpaid at this point. In 2017, Bryant made $246,376.81 per catch. For a team trying to juggle cap space to improve in other areas, that rate is simply too high. What this might come down to is Bryant's desire to remain a Cowboy versus the lure of more money elsewhere. This is a league in which a franchise gave Kenny Britt $8.125 million per season; another team flush with cap space will be willing to pay Bryant $10 million per year. It will be interesting to see if Bryant and the Cowboys can work out a restructuring, an outright pay cut or resort to a mutual parting of ways. Published: Jan. 2, 2018 at 04:12 p.m.
As if there was ever any doubt, the San Francisco 49ers like having Jimmy Garoppolo around. Well, they don't just like him. They like him, like him. So much so that they intend to lock him up for the long haul this offseason. "We want Jimmy to be a Niner for a long, long time," general manager John Lynch told reporters Tuesday. "That process is going to take place here and we're eager to get that done, to have the opportunity." 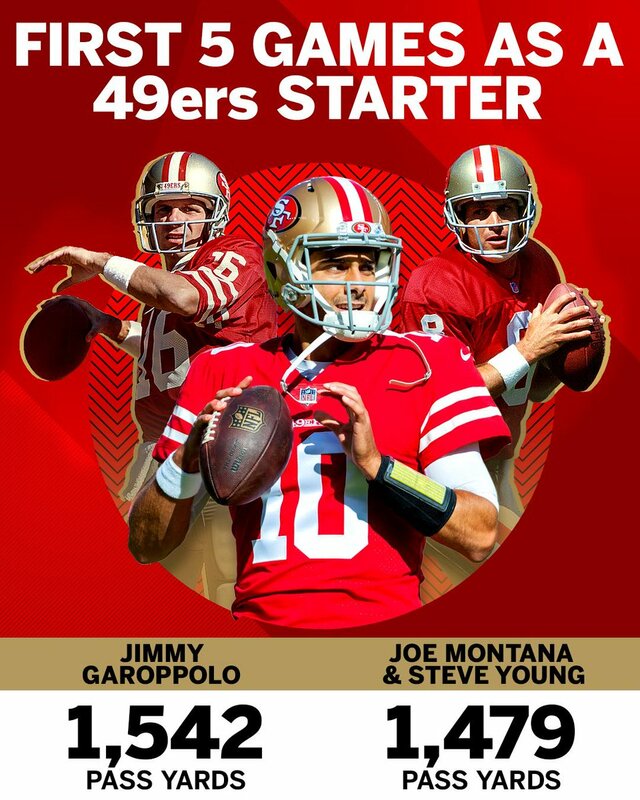 Garoppolo is a pending free agent, but after his extraordinary close to the 2017 season, an undefeated run in which he beat three playoff teams, threw for 1,560 yards and seven touchdowns with a 67.4 completion percentage and wooed the entire 49ers roster into gushing submission, there's no justifiable excuse for San Francisco to let him walk into the open market. The Niners' options instead are to either franchise-tag Jimmy G or sign him to a long-term contract, potentially making him the highest-paid player in the league. While Lynch added that he will not talk publicly about the ensuing negotiations with Garoppolo, the GM did offer that he has had conversations with Garoppolo and the organization knows where the QB stands. "We're going to work hard to keep him as a 49er for a long, long time," Lynch said again. "We want him here." Highest paid player in the league, what? He's definitely been very good, but he's still only played in the equivalent of not even a full season's worth of games and only started about half of those, I believe. I know going rate for QB is high but jeez, just doesn't sound right to me at this point. Tag him for sure if you can't come to an agreement. But like 2 said he has the bare minimum starting experience in 4 seasons in the league. No way should Lynch make him the highest paid player. I knew Mike Brown was loyal but this is ridiculous. To Lewis' credit though he doesn't seem to have lost the lockeroom. He also has no control over the morons on his defense either..
Teitan wrote: He also has no control over the morons on his defense either..
Let me know if there is a thread on this. Didn’t see one. Ronde Barber did NOT make the final 15 in his first year of eligibility. John Lynch is once again in the final group. This years first timers are Ray Lewis, Randy Moss and Brian Urlacher. Agent Orange wrote: Let me know if there is a thread on this. Didn’t see one. While I've said in the past I don't think either Barber or Lynch are HOFers, I'm surprised Lynch is a finalist over Barber. Not his decision unfortunately. 49ers would be a prime candidate of the elgible teams that could be selected if no team volunteers for it. Are the Miami Dolphins planning to reboot the machine under center? Meeting with reporters Wednesday, coach Adam Gase went out of his way to back veteran Ryan Tannehill, saying, per The Miami Herald: "I see him as our starting quarterback" in 2018. Gase added that Tannehill is on pace to participate in spring workouts, saying the 29-year-old passer "will probably be stronger than he's ever been" after suffering a season-ending knee injury in training camp. Gase strongly hinted that veteran Jay Cutler would not have a role with the club in 2018, which comes as little surprise. Miami's disappointing 6-10 campaign was forcefully thrown off track by Tannehill's setback -- his second knee injury in less than a year -- but the Dolphins aren't planning for a quarterback competition. "It is what it is. Get him back next year and we'll have a full slate with the spring, training camp, preseason," Gase said of Tannehill. "There was nothing we could do once he got injured. We made the adjustments we had to make." It's notable because Miami holds the No. 11 pick in a springtime draft littered with quarterback prospects. Meanwhile, Tannehill's $17.5 million salary for 2018 isn't guaranteed until March. A parting of ways is feasible, but Gase sees Tannehill as a key piece of the puzzle -- not a guy about to lose his job. FYI: Rumor says Darcie nixed the Gruden re-hire, causing the plans to crash and burn last week. Just a rumor. Also, Coach Gruden has informed ESPN that it is likely he will take the Raiders job. Interesting. Because she wanted to stick with Koetter or because she didn't have faith in Gruden Redux? Gruden also dismissed any notions of him being offered an ownership stake. Deja Entendu wrote: Interesting. Because she wanted to stick with Koetter or because she didn't have faith in Gruden Redux? I don't know. Coach Gruden is probably accurate when he says he was never "offered" an ownership stake, but that doesn't mean his rep didn't float it as a potential part of his compensation. If you don't ask, you don't get. If indeed his rep floated the idea to the Glazers, Darcie might have balked at giving up a piece to a non-family member. Again, I don't know for sure, I wasn't there (of course). Just going on the completely unverified info I was told. You're not going to find 26 owners who will sign off on giving a head coach an ownership stake. Bootz2004 wrote: You're not going to find 26 owners who will sign off on giving a head coach an ownership stake. I would agree. But no other owners had ever traded draft picks for a coach, either. If they did ask it was certainly worth a try. Meaning PRIOR to the Glazers trading for Coach Gruden. I think he meant no owner before the Gruden trade. Making the point that the Raiders ownership might be willing to do things other owners wouldn’t try. Edit: I should have refreshed the page. DTG already clarified.